Put SunRidge Canyon Golf Club on your near-term play list and go enjoy one of Arizona’s most demanding, yet rewarding, championship layouts. Owners Don and Cindy Misheff, who purchased the club in 2010, have implemented some serious improvements during their stewardship and the results are spectacular. First, the golf course. Long before the term became popular, avid local players respected Keith Foster’s 1995 “minimalist design” for its maximum challenge. The uphill climb home through holes 13-18, dubbed the “Wicked Six”, is one of the most memorable finishes in town. These six closers require precise play to score well, but whatever you post, the spectacular scenery you traverse while playing them always seems to pay off in spades when the last putt is holed, high atop the property on the 18th green. True to form, the Misheff’s used the summer season to raise the SunRidge Canyon playing experience to a higher level by converting all 18 greens to Champion Dwarf Bermuda. Be advised the National Turfgrass Evaluation Program Trials concluded that Champion achieved STMP meter speeds approaching two feet faster than other ultradwarf cultivar surfaces. The layout remain the terrific test it’s always been: two precise shots over two transition areas at the picturesque par-4 seventh, an elevated, white-knuckle tee shot at the water-wrapped par-3 14th and the solid, uphill 18th closer. The elegant greens only enhance the experience of playing SunRidge’s artful design. And when the last putt drops, prepare yourself for more great fun: the new Wicked Six Bar and Grill at SunRidge Canyon. The hacienda-style clubhouse at SunRidge has always provided one of the best “local hang” spots in town, but now it’s been amped up with a new full-service menu, an engaging staff and a comfortably-modern decor. 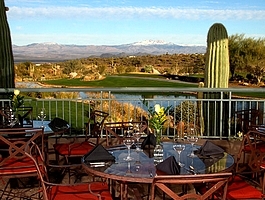 When you add in the elegant indoor-outdoor patio and that panoramic view of Four Peaks beyond, your card totals: great golf, good vibe, wicked fun. Visit SunRidge Canyon Golf Club at www.sunridgegolf.com for all the details. Click SunRidge Canyon Golf Course Review to read our AZGA player’s review of the golf course. It’s one more jewel in the treasure of “All Things Arizona Golf” at the Arizona Golf Authority.